We might never know Tom’s true identity. But, Tom, if that is your real name — good going. You came awfully close. With five players involved, this is a big trade for two teams to make. But then, if we’re going to be realistic, this isn’t about the players at all. This is a swap of money, or, more accurately, this is a swap of debt. There is short-term debt, and there is shorter-term debt. By name value, this could look like a blockbuster. Kemp is a two-time All-Star, and once finished as an MVP runner-up. Gonzalez is a five-time All-Star, and he’s been one of the better first basemen of his era. Not that long ago, the Dodgers gave McCarthy $48 million as a free agent. They also gave Kazmir $48 million as a free agent. There’s a lot of baseball history here. These players, combined, have made hundreds, if not thousands of headlines. But Gonzalez is already a free agent. The Braves designated him for assignment so fast that it was part of the initial press release. Kemp is unlikely to play a game for the Dodgers, since they’re already looking to flip him, if not drop him outright. Kazmir didn’t pitch in the majors this past season. McCarthy did, but he threw just 92.2 innings. Culberson batted all of 15 times before making the playoff roster because Corey Seager was hurt. All of these players combined for a 2017 WAR of +0.7. It was all thanks to McCarthy, and his 16 adequate starts. In other words, this is a baseball trade, sure, but it’s not the kind of baseball trade you dream up as a teenager. It’s not the kind of baseball trade you can identify as a turning point in a team’s run to a championship. We’re used to examining trades by looking at the talent. To examine this trade, you just have to look at the contracts. The Dodgers are taking mostly dead money for 2018 and spreading it out over the next two years. The Braves, in turn, are doing the opposite of that. That’s the bulk of it, and anything the Braves get on the field is gravy. You can imagine it was the Dodgers who instigated this. Gonzalez was basically out of a job. And the Dodgers have wanted to drop payroll below the 2018 competitive-balance-tax threshold, of $197 million. The Dodgers have gone over the threshold five years in a row, meaning they’ve had to face some of the stiffest penalties. The Dodgers have been paying a minimum of a 50% tax on the overage. Dropping below the threshold for one season would reset the overage penalty to 20%. For the Dodgers, there would be millions of dollars at stake. So here’s how this works. Gonzalez’s 2018 salary belongs to the Braves now. Then his contract is up. The same is true for McCarthy, and the same is true for Kazmir. Culberson does come with some years of team control. The Dodgers are also sending the Braves $4.5 million. And Kemp’s 2018 salary now belongs to the Dodgers. So does Kemp’s 2019 salary. In each year, he’s due $21.5 million. Arriving at the correct, specific numbers isn’t easy, for a variety of reasons, but as far as anyone ought to care, this exchange is more or less cash-neutral. That is, neither the Braves nor the Dodgers are taking on the greater obligation. But the Dodgers are spreading it over the next two years, reducing their 2018 payroll figure. The Braves will face the greater short-term burden, and then, come 2019, there will be sweet, sweet freedom. The Braves ditch a future obligation, giving them more financial flexibility a year from now. The Dodgers assume a future obligation, but they, too, will get more financial flexibility a year from now, and beyond, because they likely won’t have to pay the most severe competitive-balance taxes. All they’re worried about is getting the overage penalties to reset. From the looks of things, the Dodgers are now below the payroll threshold, and they should be able to stay there. They like the team they already have, and if they want to make a significant addition, they could clear more space by packaging Kemp with a prospect. The Dodgers certainly don’t need very much, as they’re positioned as clear NL West favorites. This is all being done with an eye to the future. Next offseason, Bryce Harper, for example, is expected to be a free agent. Manny Machado is expected to be a free agent. All sorts of good players are expected to be free agents, and, significantly, Clayton Kershaw could opt out. The Dodgers are presumably planning to spend big, so resetting the overage penalties now could and should eventually save them eight figures. All it requires is one year of dipping down. The current starting rotation has had its depth slightly reduced. The current infield has had its depth slightly reduced. Yet the Dodgers’ system is sufficiently deep the team should carry forward just fine. And though Kemp doesn’t fit on the Dodgers at all, he is still a playable hitter. He’s just maybe the worst of all the defensive outfielders. Kemp should end up in the American League, and the Dodgers could invest any possible savings in an extra arm. I can’t imagine they’re greatly concerned. In a way, you could look at this trade and say the Braves are just doing the Dodgers a favor. It’s not as if the Braves are receiving a prospect for their troubles. Culberson will be 29 in the second week of April. His career major-league WAR is -1.2. Kazmir is a complete unknown, and his contract is up next fall. McCarthy’s contract is also up next fall. But there are two positives here. McCarthy, when healthy, remains a modestly effective starting pitcher, so he could give the Braves’ volatile rotation a little short-term stability. It’s something, even if he’s not the sort of pitcher who can get dealt at the deadline for a haul. And there’s the bigger matter of clearing Kemp’s 2019 obligation. I’ve seen it written that moving Kemp clears the way for Ronald Acuna. If that were the priority, Kemp could’ve just been designated for assignment. But there’s great appeal in just having more money to play with down the road. It will, again, be a great free-agent market. The Braves should be in a more competitive position. This is something the Dodgers wanted, but it’s also something the Braves wanted. That’s how trades get agreed to in the first place. This isn’t a fun kind of trade. Not in the classic sense. None of these players are likely to matter too much, in the grand scheme of things. But what this trade is is creative, and it helps to set up both the Braves and the Dodgers to be major offseason spenders going into 2019. Maybe you’d prefer the Braves to have gotten a prospect or something. Maybe you think the Braves had more leverage than it seems. There were only so many teams that would’ve been willing to help the Dodgers out. But ultimately, this still seems pretty much win-win. Next year’s winter is going to be a gas. We hoped you liked reading Dodgers Trade Debt to Braves in Exchange for Debt by Jeff Sullivan! This was me. I am Tom and yes, my actual name is Tom. What I think this proves is that Andrew Friedman and Farhan Zaidi obviously read Fangraphs chats and took your idea. That or you are psychic. Those two things, or you did some good baseball/contracts analysis. Either way, good job. I will go with a 0.01% chance that someone in either team’s FO saw this and it made any impact on subsequently actions. I mean, Kiley McDaniel does work for the Braves and a slew of SABER slanted writers have jobs in MLB. Teams are looking at these sites. Too bad Tom can’t get any kickbacks. Come on Kiley, send the man a shirsey or something. Or SABER slanted folks might have parallel thought processes. I mean, their book is filled with quotes from executives who say that they read it, and that was frequently true just a few years ago, probably still is. Dude, you are officially already a better GM than actual GMs Jim Bowden, Omar Minaya, or Dave Stewart. This is one of the coolest things I’ve seen in my 5+ years reading FanGraphs. Good stuff. Back when Rex Barney was the PA guy in Baltimore, he had a thing he used to do. When a fan would catch a foul ball, he’d say, “give that fan a contract!”. You, sir, are a fan who deserves a contract! Well done! Nice call, Tom. I remember reading this, and I thought, huh, not a bad idea. Cheers to Tom! Man, it was just painful reading some of the responses to your post on that Braves board. Stick to Fangraphs! I was on a couple of boards, including one where Tom posted, and I was promoting the idea, but little traction. Unfortunately I have been posting with many of the same people for years. There are many posters there that have a hard time accepting the reality that MLB has changed significantly in the past couple decades. We get into some spirited debates and I enjoy it. In fairness, Tom, you’re insisting that this trade frees up money for the Braves in 2019 when that isn’t true at all. This trade simply shifted payroll commitments from 2019 into 2018, it didn’t change anything about how much additional money the Braves will or will not spend in 2019. In fairness, you’re insisting it doesn’t free up money in 2019 when that isn’t true at all. This trade simply shifted payroll commitments from 2019 to 2018, freeing up money in 2019. Not really, because it’s unlikely that Atlanta is going to reach the luxury tax. Atlanta could have held the ~20 million that they wouldn’t have spent had they not done the deal, put it in a bank account, and used it to spend in 2019. The reason they did the deal was because McCarthy/Culberson/maybe Kazmir are more useful to the team than Kemp. That is not how the Atlanta Braves (a real-estate subsidiary of Liberty Media Corp) are operated. They have an annual budget for payroll, and this makes a lot of room for 2019. If they had a fixed annual budget then they obviously wouldn’t have been able to increase next season’s payroll by $20 million. Plus, that’s simply not the way any business works. It’s crazy that Tom is getting upvoted and I’m getting downvoted when he doesn’t understand basic economics and his fundamental argument for the Kemp trade is completely wrong. No money is being freed up for 2019. There apparently is a single misunderstanding you have with this entire situation. The Braves are still underneath their 2017 payroll. Even after absorbing all of the salaries in this trade, their 2018 payroll is still underneath their 2017. Apparently you are one of the lucky ones that forgot about the $12.5 million the Braves spent on Bartolo Colon in 2017, the $12 million on Jamie Garcia, the $8 million on RA Dickey, the $5.75 on Sean Rodriguez, or the $5 million on Jim Johnson. I wish I could forget like you did. You’re one of the lucky ones. Braves cleared $43.25 million o salary right there. Then when you factor in trading Kemp away and clearing his salary…you realize that they can easily absorb this into their 2018 budget alone. And be freed of any commitment in 2019. Give it up man. Doesn’t matter how many times you say that this isn’t clearing any money in 2019, it is. No, it isn’t, because that is not the way businesses work. Every single major league team makes projected budgets for future seasons, which is how they are able to decide how much to offer and over how long in various contracts. So for Fiscal Year 1, the Braves would have budgeted X amount for salary expenditures, then they would have a rough idea of the Y amount that they would allocate for Fiscal Year 2. If you move $21.5 million from FY2 to FY1 without simultaneously increasing revenue, then that correspondingly reduces any profit you might expect to see from FY1, and might even result in a loss. Reduced profits or a loss would then absolutely affect the budgeted amount of Y for FY2. Pretending that the budgeted amount for FY2 would stay the same even though a company absorbed an extra $21.5 in FY1 simply is not realistic and shows a fundamental misunderstanding of how businesses operate. This trade was absolutely not about freeing up money for 2019 (FY2) because moving salary obligations up a year means having to pay more now than you were planning to, which means less money available for the following season. This trade did not reduce the amount of salary commitments for the Braves, it simply changed when they were to be paid. Correct. Now they pay them a year earlier and they are now clear of Kemp’s obligation in 2019. Freeing themselves of that salary, allowing them to spend more. So glad we are on the same page. The money they were going to pay for Kemp’s salary in 2019 is now being paid to other players in 2018. The money to cover that cost has to come from somewhere. It does not magically appear out of thin air. 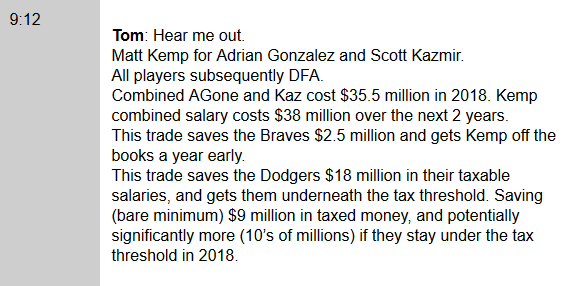 Where it actually comes from is the pool of money that had been budgeted for future salary commitments, so the money that would have been spent in 2019 on Kemp is being spent in 2018 on other players instead. That money will then be gone. You’re wrongly thinking that the money will magically reappear and allow the Braves to double dip, spending that money not only in 2018 but in 2019 as well. It doesn’t come from the 2019 roster, it comes from the 2018 budget. But…you’re too stubborn to understand the reason you’re fighting a war all by yourself…is because you’re very wrong. You are mistaken in equating 2018 salary with 2019 salary. Look at the US tax system; you can’t write off a past year’s business expense from a current income… the Braves write off 30M from their profits in 2018 and save that much in resulting taxes. If you’re arguing they could have spent the 30M on free agents instead, then they’d have 30M PLUS Kemp’s 21M on the books next year. Instead, for accounting purposes, they created a 30M tax write-off for 2018 (which would save themselves 14-15M). Basically, they had 30M to spend and instead of spending on middling free agents, they employed it to erase a 21M commitment in 2019. It’s a pretty beneficial accounting maneuver. They get to spend 21M extra on their payroll next year. Otherwise, if they just sat on their payroll space this year, they’d pay an enormous tax on their profits in 2018, and have 20M less to spend next year. Accordingly, you are not taking into account the millions the Braves save in taxes by this accounting. Talking Chop isn’t a bad Braves board either. Or did he steal this from you?